Sometimes I miss cheese. That is a fact. However, I also do not miss the tight, achy feeling just above my belly button the day after I eat cheese. I call this a dairyache. This is an invented word, but directly reflects the truth. I don’t have a stomach ache, because it is not in my stomach. It is further through my digestive tract. This is what makes food intolerances so tricky; sometimes you don’t feel the effects until a day or three after you eat a particularly offensive food. How have I come to understand what exactly is causing my symptoms? Through food elimination protocols. Is there a magic pill? NO!! If you want to be healthy you need to eat real, unprocessed, whole foods (meat, fish, poultry, vegetables, fruit, nuts, seeds, fats) for at least 30 days exclusively. And that is just the beginning. Then add one food at a time back in to see what adversely affects you. For example, have a small amount of dairy for three days after not having it for a month and see if you notice any ill effects. So when you’ve had a long day at work and really just want some cheese, crackers and wine to relax with, what do you do? 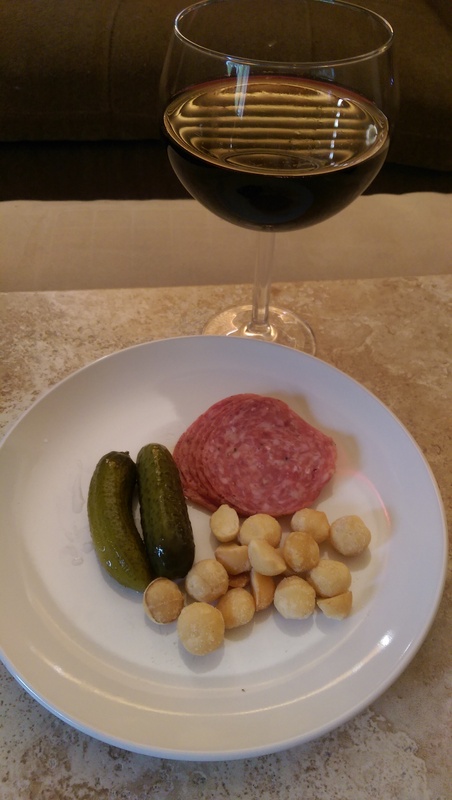 I put together a rather delicious plate of dill pickles, uncured salami & macadamia nuts. And some red wine, which through the elimination process I have learned is okay if I stick with sulfite fee selections.